Our 64-slice CT scanner gives our patients superior imaging in a comfortable environment. 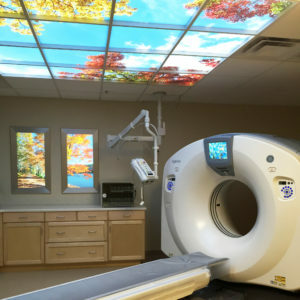 Improved patient experience with shorter scan times, improved patient access and positioning, and a video of relaxing scenes or cartoons for children. High Detail, Low Dose features offer the ability to see the smallest diagnostic detail with up to 60% dose reduction. Infections, appendicitis, diverticulitis, pyelonephritis or infected fluid collections, aka. abscesses. Inflammatory processes such as pancreatitis, liver cirrhosis or inflammatory bowel disease such as ulcerative colitis or Crohn’s disease. Abdominal aortic aneurysms (AAA) and other diseases of the arteries and veins such as blood clots and abnormal narrowings also known as stenoses of the vessels. In many ways CT scanning works very much like other x-ray examinations. X-rays are a form of radiation-like light or radio waves-that can be directed at the body. Different body parts absorb the x-rays in varying degrees. In a conventional x-ray exam, a small amount of radiation is aimed at and passes through the body, recording an image on photographic film or a special image recording plate. Bones appear white on the x-ray; soft tissue, such as organs like the heart or liver, shows up in shades of gray and air appears black. CT imaging is sometimes compared to looking into a loaf of bread by cutting the loaf into thin slices. When the image slices are reassembled by computer software, the result is a very detailed multidimensional view of the body’s interior. Modern CT scanners, like the one at UBMC, are so fast that they can scan through large sections of the body in just a few seconds, and even faster in small children. Such speed is beneficial for all patients but especially children, the elderly and critically ill.